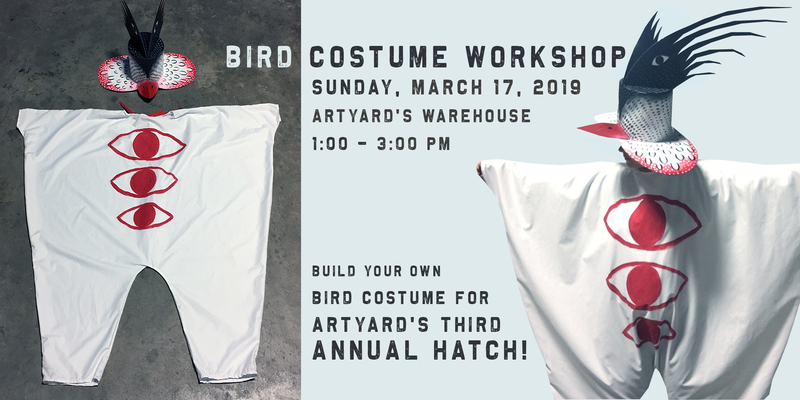 We invite you to build your own bird costume for ArtYard’s Third annual Hatch! On Sunday, March 17th from 1-3 PM, ArtYard will be hosting a costume making workshop in ArtYard’s warehouse. Bring your own sheets, remnant fabric, old bedspreads, safety pins, needles, thread, and learn how to construct an inspiring bird to wear in ArtYard’s next Hatch on June 15th, 2019. We’re going to be creating simple bird “jumpsuits” like the one showing here that you can personalize by painting on it, adding elements such as feathers…your imagination is the only limit! A costume like the one in the picture requires more or less 3 yards of fabric, depending on your body size. Old sheets are great for it, they don’t have to be white. The Hatch is ArtYard’s inaugural event celebrating incubation and creativity. The workshop is free and will be guided by Elsa Mora and Jill Kearney. ArtYard has additional fabric, trims, etc which you are also welcome to use, but we will not have enough for all, so please bring what you have! Below is a link to a video of past Hatches and the spontaneous dance that followed our last Hatch! * If you created a costume for a previous Hatch at ArtYard, you will be welcome to wear it again on June 15th. But you might want to build extra costumes for your friends or neighbors! We look forward to seeing you on March 17th!